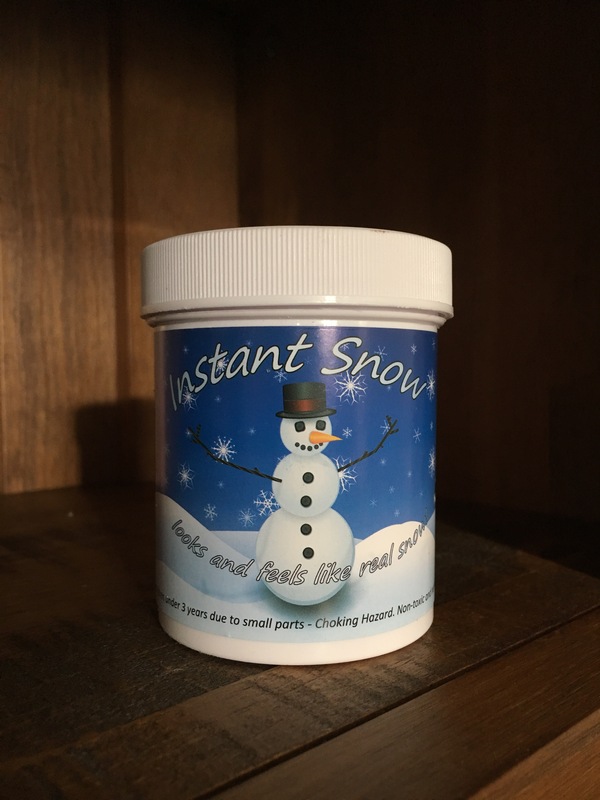 This afternoon we decided to crack open a tub of our instant snow, seeing as we have raved about it for the past 2 months we thought we’d better give it a go for ourselves. The link to this product is at the bottom of the post. The tub states that ‘it looks and feels like the real thing’…And we were not disappointed! This stuff is incredible. 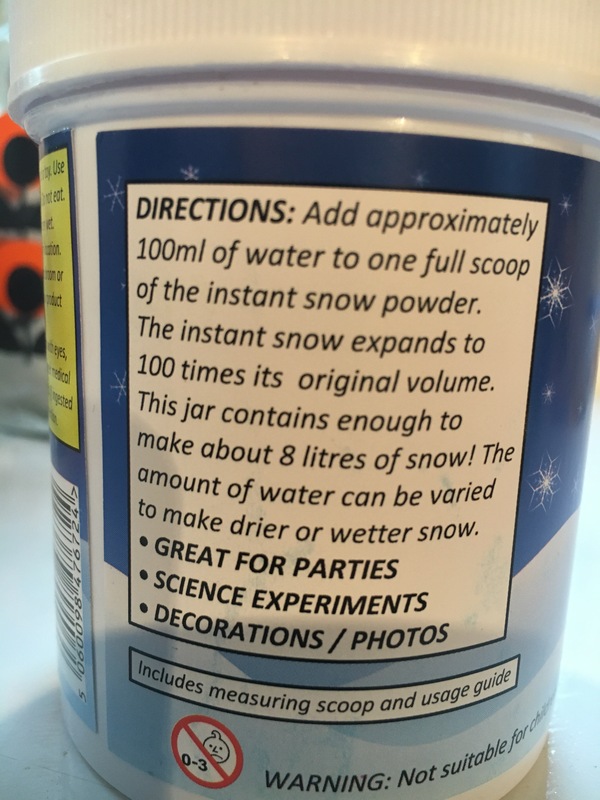 It’s easy to use (you just add water), its ready within seconds and it really does look and feel real. In fact, the first thing my 3 year old said when he touched it for the first time was ‘it’s cold’. It’s hard to describe just how good this product is. For the record, I’d just like to clarify that this is NOT a toy. It is not designed to be ‘played’ with. However, with adult supervision my 3 year old enjoyed the sensory experience of handling the snow in his tuff spot. 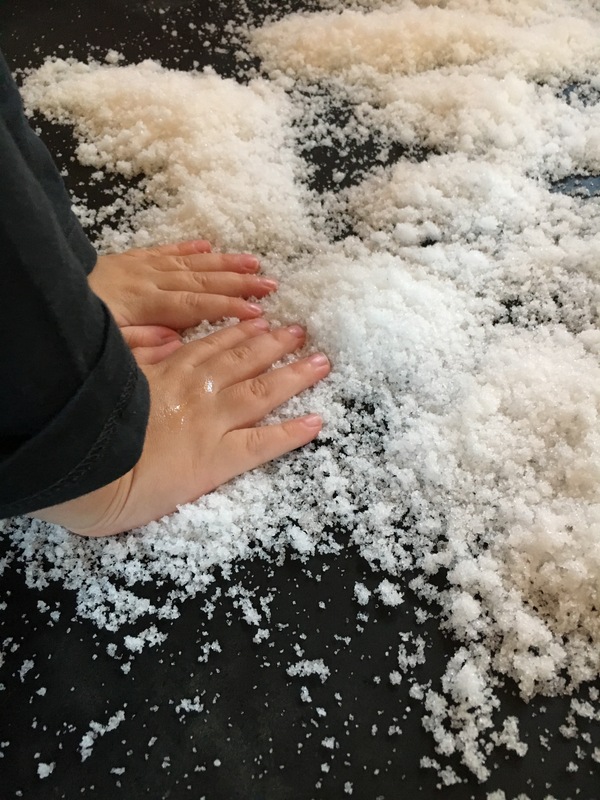 With a little common sense and a lot of adult input, this instant snow can be a fantastic sensory resource for pre-schoolers. 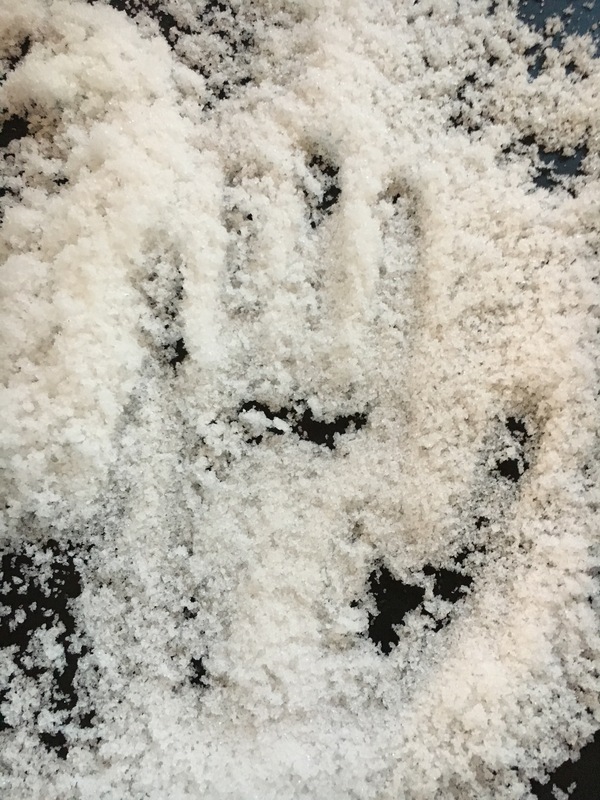 Mine enjoyed running his hands through it, making prints and picking it up to let it fall from his fingers. In short, this would be brilliant for a sensory tray. We then tried to use the snow for decoration and, again it does the job really well. 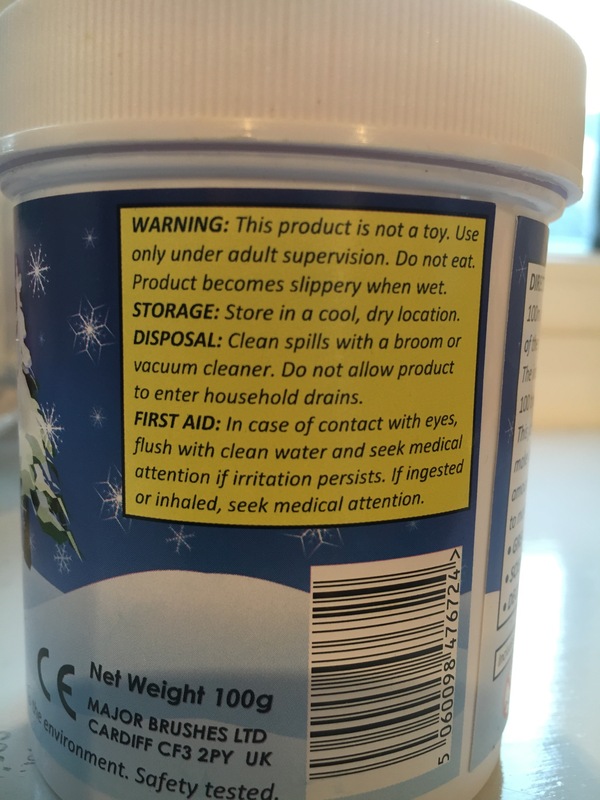 It is recommended that you use this product inside, but I tried it outside just to see the effect. 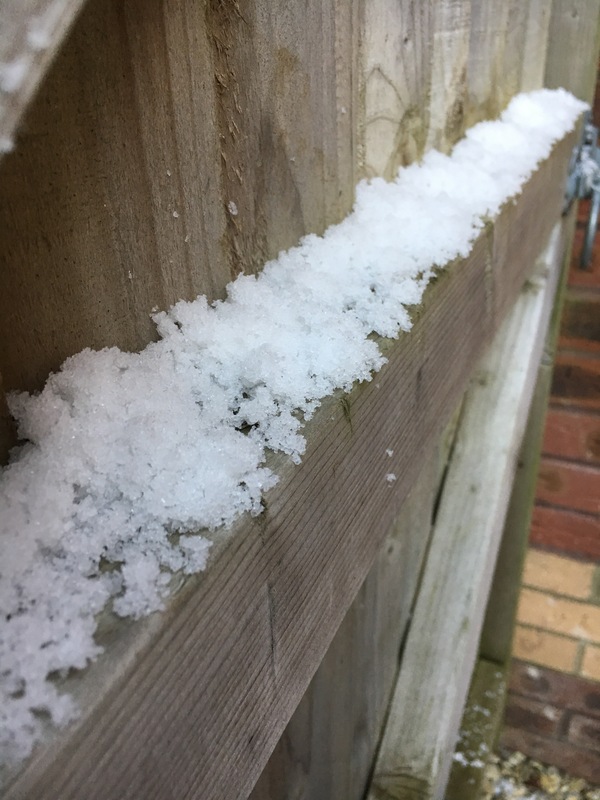 In my opinion it looks just like a light snowfall. This could be equally effective inside on windowsills, nativity scenes and on trees. All in all we felt that this was real value for money and incredibly effective. We didn’t even use half the tub, but it was more than enough for discussing the process scientifically (as it expands in the jug) sensory fun and light decoration. My preschooler is 3, which is the recommended age on the tub and I would agree with this. I waited until my 18month old was having her nap as I didn’t feel comfortable letting her near this. It does pose a chocking hazard. Decorating Pumpkins… an activity for younger children.